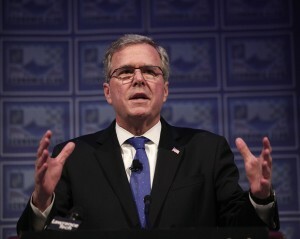 TALLAHASSEE, Fla. — Jeb Bush ended Florida’s affirmative action programs in 1999 with a flourish, issuing an executive order that he said would “transcend the tired debate” about racial preferences. Some lawmakers grumbled about the first-year governor making such a move without consulting them, and two black legislators staged a 25-hour sit-in at his office to protest. Bush refused to budge. “We’re doing the people’s work and I’m not going to let anybody, for any reason, stop us from doing that,” he said. Lawmakers would have to get used to it. Bush was an aggressive chief executive throughout his tenure as Florida governor, pushing the limits of executive authority, bristling at legislative oversight and willing to work around the courts. “He doesn’t shy away from the fact that he had a big agenda, and if there was a way to move it along quicker, he would find it,” said Cory Tilley, a Republican consultant who served as Bush’s deputy chief of staff during his first term. “I think the next president is likely to undo much of the executive orders, particularly the ones where there was no constitutional authority to do these executive orders,” Bush said last week in Myrtle Beach, South Carolina. Until Bush’s election in 1998, the governor’s office in Florida had little relative power. But that same year, voters shrank the size of the state’s independently elected cabinet and gave the governor control over education and elections. Bush embraced the changes and, with the backing of a GOP-controlled Legislature, asserted himself in ways Tallahassee had not seen before. Earning the nickname “Veto Corleone,” a pun on the main character in “The Godfather,” he cut a record number of legislators’ local projects from the state budget and demanded lawmakers clear special spending with him in advance. Before the end of a blistering first year in which he won legislation to overhaul education, limit lawsuits and cut $1 billion in taxes, Bush signed his executive order on affirmative action. A Tampa Tribune cartoon depicted him as the Tasmanian Devil zigzagging through traffic. The Legislature successfully sued Bush for interpreting his veto power too broadly, but it ultimately gave Bush most of what he wanted. Bush took the step to change affirmative action in university admissions and state contracting in part to head off a prospective ballot measure he thought was more divisive. But before he did so, he consulted with the Clinton administration and small groups of African-American legislators, ministers and students. It nevertheless blindsided many lawmakers and black leaders. Bush agreed to hold three public hearings on his effort and delay its implementation, and later said his only regret was not taking more time to explain the program. Bush was less patient with the courts, seeking to sidestep a number of rulings that struck down his goals. After a Florida judge rejected a Bush-backed law requiring minors to notify their parents before getting an abortion, the governor and the Legislature supported a ballot measure to carve out an exception in the state constitution. Voters approved the change. Frustrated by what he saw as judicial activism, Bush also pushed for a law that gave him the final say over appointments to the state panels that nominate judges. That belief soon surfaced in the case of Terri Schiavo. Doctors said the severely brain-damaged woman was in a “persistant vegetative state,” and a judge’s ruling that her husband could remove her feeding tube had withstood years of court challenges. Bush, a devout Catholic, sided with Schiavo’s parents, who disputed the diagnosis and said their daughter, also a Catholic, would not want to be taken off life support. Bush signed legislation in 2003 that gave him the authority to order the woman’s feeding tube reinserted, but the state Supreme Court struck down that law as unconstitutional. Associated Press writers Gary Fineout in Tallahassee and Bill Barrow in Myrtle Beach, South Carolina, contributed to this report.